By cutting out meat you cut out a lot of the cholesterol, fat, as well as hormones and chemicals that animals get pumped with. The numbers don’t lie, and vegetarians have a lower risk of all forms of heart disease and stroke, as well as a longer longevity, all else being equal. That’s reason enough to start eating more healthy vegetarian meals like the ones we’re presenting here. A vegetarian lunch does a great job of holding you over until dinner, without weighing you down and giving you the afternoon sluggishness. Here are a group of lunch recipes that you can make somewhat quickly for a midday respite. 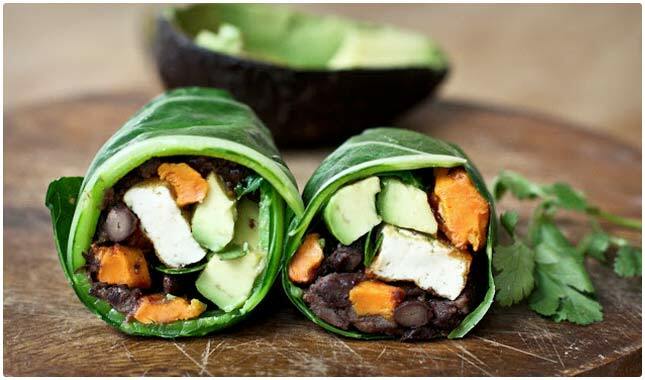 Collard Green Wraps with Roasted Yam – They walk you through this recipe step by step so that you can get the same picture-perfect wraps they ended up with. The collard greens will supply plenty of phytonutrients and minerals, and the yams are one of the most recommended carbs on diet plans across the country. The use of avocado gives you nice healthy fats, and keeps you fuller longer. Beetroot Leaf and Yogurt Flatbreads – These flatbread sandwiches look interesting if nothing else, and they’re using a superfood that often gets overlooked, but should really be in the spotlight more: beets. They’re not using the pickled beets you find in a jar, but raw beetroot. Combining it with yogurt is a unique idea, and they look great once they’re all assembled and ready to eat. Whole-wheat Wraps with Grilled Veggies, Feta & Hummus – Whole wheat wraps are a good start, and the grilling of the vegetables makes them taste far better than just about any other cooking method. The feta cheese adds a bit of tartness, but also has its own healthy benefits. The hummus is made from chickpeas, which help you feel full and satisfied all afternoon.They even manage to squeeze in zucchini and eggplant for good measure. Spicy Lentil Wrap with Tahini Sauce – Both the lentils and bulgur form the bulk of this wrap, and are a perfect substitute for a meaty center. The tahini dipping sauce steals the show on this one. Wraps are just more fun when you dip them, and this sauce has flavor to spare. The red pepper flakes give it a bit of a kick to wake up your taste buds and keep you coming back for another bite. Smashed Chickpea Greek Salad Sandwich – Whoever came up with the idea to put a Greek salad onto a sandwich was a genius. They’ve done well by adding chickpeas to it to give it some texture and adding bright and colorful tomatoes so it also looks great. The combination of olives, cucumber and spices means you’ll probably find yourself opting for this sandwich weekly. See more healthy lunch recipes. When most meat eaters consider going vegetarian, they picture themselves eating salads and think it will be miserable. Here are a handful of salads that would make even the biggest carnivores reconsider, at least for one meal. 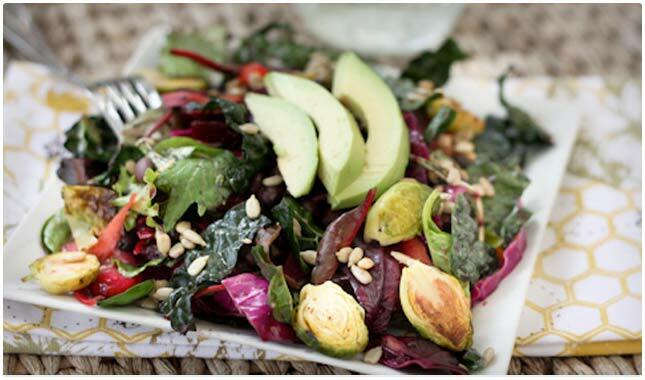 Detox Salad – The key to detoxing is not to retox. Here’s a salad that will help your body purge itself of unwanted substances, but also one you can just eat if you’re trying to be healthier. The duo of roasted beets and roasted Brussels sprouts means that your body is getting foods it really craves, and you’ve got a concoction of several different superfoods, including avocados. Sunflower seeds and cabbage are in here as well, just a smorgasbord of healthiness! Dried Cranberry Couscous Salad – This couscous salad looks so good you just want to drop a spoon in it and get to work. The cranberries give it a tartness and a sweetness at the same time, so your palate won’t get bored. It also has cucumbers to help hydrate the body, and just enough feta cheese to add a nice amount of flavor and to go with the berries, but not add too much fat. Kale, Edamame, and Quinoa Salad – Kale and quinoa combine to make this a healthy salad from the word go, but then they put edamame in it and now you’re really cooking. The lemon vinaigrette the include the recipe for makes sure you’re not just chewing this up, but actually enjoying each bite. They also put an avocado in it so you’re helping your heart, lowering your cholesterol, and lessening the chance of getting a stroke. Excellent! Vegetarian Buffalo Salad – Have you gone vegetarian and are missing your buffalo wings? This salad promises to give you all of the taste you thought you couldn’t have anymore, without the chicken. The way they accomplish this is by using chickpeas and cauliflower in place of the meat. The cauliflower does a great job of soaking up the hot sauce and won’t leave you feeling like you single handedly took down a family of chickens. Strawberry and Arugula Salad with Grilled Halloumi – The halloumi cheese used in this doesn’t add so much fat to make this an unhealthy salad. Plus it gives you protein, and gives your taste buds something to enjoy. You’re getting antioxidants from the strawberries, phytonutrients from the arugula, and the cheese is grilled, not fried. The pistachios provide a nice crunch and also the benefit of a healthy nut. Here are some great meatless breakfast options for you to try. A few of these use eggs, which some vegetarians might not be OK with, but the others don’t, and would appeal to a larger base. What they all have in common is that they’ll be a healthy start to your day. 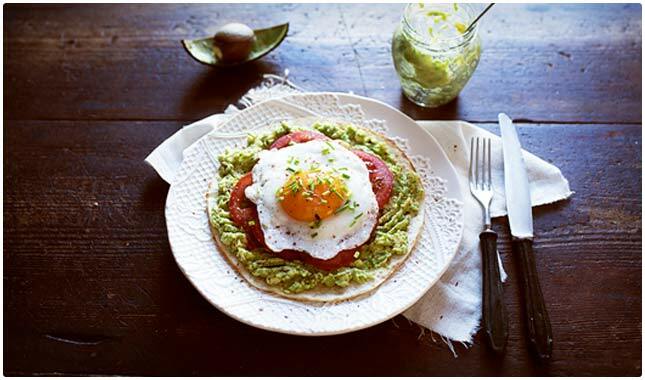 Pita with Avocado and Fried Egg – The tomato and spices really give this an amazing presentation, and all of the ingredients used are good for you. The avocado is going to give your body some healthy monounsaturated fat, and the recipe is flexible, allowing you to scramble the egg if fried just isn’t your thing. Putting it all in a pita makes this great for a busy morning when you need to eat on your way to work. Huevos Rancheros Breakfast Burrito – This is a spin on a popular Mexican breakfast that serves it all up on a tortilla, so it’s great for an on-the-go breakfast as well. It contains black beans, which will add fiber to the meal and help you feel fuller longer. It also has avocado as a topper so you’re getting healthy fat into your body. A little bit of salsa kicks things up a notch without adding fat or a lot of calories. Mixed Vegetable and Cheese Sandwich – While this may not look very much like a breakfast, the recipe creator says it works just fine as an AM meal. They recommending having a nice glass of orange juice with it to complete the package. The yummy mix of vegetables will wake up your taste buds, and give you a supply of nutrients to carry you through your morning. Tortilla de Patatas – Here is a unique breakfast option, combining potatoes, onions, and eggs to form a dish similar in appearance to a quiche. They use a horseradish mayo for the top of it, and this is sure to get your mouth interested in breakfast. They have it served with a side of lambs lettuce, to add more vegetables into the mix and make it more nutritious. Tofu Scramble for Two! – If you like tofu and have been wanting to get more of it into your diet this is a way to do it. This is a vegan option that does away with all animal products, and even animal byproducts. The end result is an eggless scrambled dish that contains plenty of superfoods including kale, bell peppers, and a tomato. It’s a fast and easy dish you can make again and again and never get tired of. See more healthy breakfast recipes. Most of the time when they try to make hamburgers vegetarian they end up with veggie burgers. If you’ve tried eating pre-packaged veggie burgers and weren’t impressed, here are some burgers that do away with the beef, but keep the taste. Sweet Potato Adzuki Bean Burger – Here’s a burger that uses adzuki beans and sweet potatoes as stand ins for the meat, and multi-grain buns to hold it with. Using baby spinach as a bed of lettuce gives this even more nutrition than using regular iceberg lettuce. They are definitely keeping your health in mind when they are stacking this burger, which should keep you satisfied for hours. Lentil Sloppy Joes – Sloppy Joes are traditionally made with ground beef, which adds a lot of saturated fat to the meal. These are made with lentils, so you’re getting the nutritious benefits from those, including fiber. They have red bell pepper in here, as well as some carrots, and they’re using a whole wheat buns. Topped with pickle slices this is a fantastic replacement for traditional Sloppy Joes. The Black Bean + Corn + Farro Vegetarian Burger – When you start with black beans as your base, you pretty much can’t go wrong. They’ll provide plenty of flavor, texture, and fiber, and they play nicely with other ingredients. The farro grains and corn really round things out here, and as long as you’re using a healthy bun you’re all set. They’re using whole wheat crumpet for style points. Crispy Sweet Potato Burgers – Sweet potatoes provide several health benefits, and also taste great. Baking them gets them nice and crisp, and avoids frying them in order to get the crispiness claimed in the title. These form the patty for this most unusual burger, and the toppings they suggest are all good for you, and add up to being quite the meal. They say you can be creative with the bun, and to prove it they’ve used English muffins in theirs. 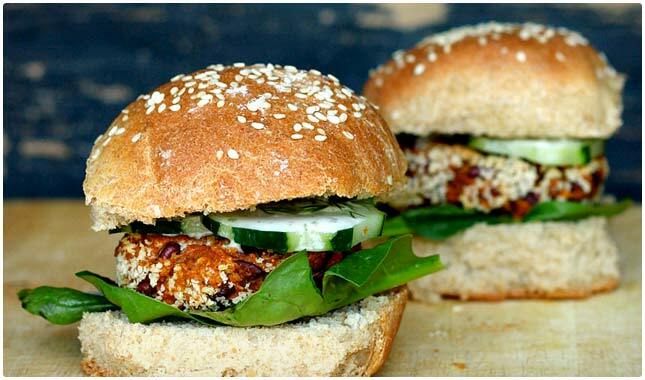 Quinoa Burgers with Mushroom Buns – Here’s a “burger” that has done away with both the meat and the bun. This means that it will not only fit nicely into a vegetarian diet but will also be great for those looking to cut out the wheat, like Paleo dieters. The quinoa provides a good texture and fiber, and the mushrooms as buns as a bit of novelty, as well as additional nutrients. Soy and Chickpea Burgers – Chickpeas are very versatile, and can provide a lot of substance to a meal that meat would otherwise provide. When combined with soy as they are in this recipe, you’re getting a double-dose of goodness, and an incredible texture in the patty. The addition of chutney and mint mean that you won’t be short on flavor, and this is a meal that is sure to keep you full for awhile. Chili lends itself quite well to being a vegetarian dish, and here are a few veggie chilis that rival any containing meat. There’s also some soups and stews mixed in that will fill you up with nutritious goodness. 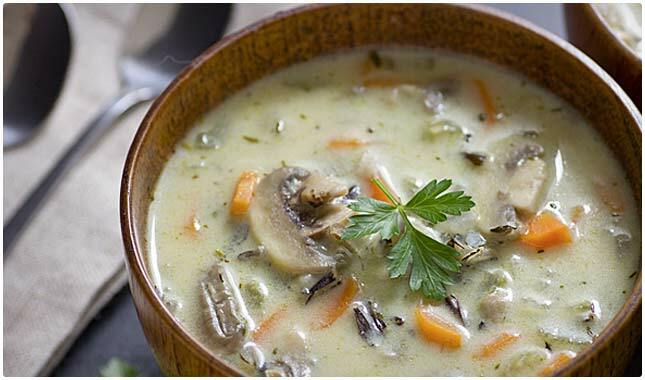 Creamy Wild Rice and Mushroom Soup – Reduced fat sour cream is used for the creaminess of this recipe, so don’t let the title or the picture fool you. You can still enjoy this soup while watching your weight and being more healthy. The mushrooms, celery, and carrots all bring with them their vitamins and minerals, and the wild rice provides a nice texture to counter the creamy style. They use flour in this recipe, so it’s not gluten-free, and many strict Paleo dieters would probably stay away as well. Black Bean and Sweet Potato Chili – This is a hearty chili that is sure to please. It gets its thickness from the black beans, as well as the chunks of sweet potato. Both of these ingredients also contain good amounts of fiber to help with regularity. Aida also includes cumin and chili powder for a classic taste, and enough garlic to ward off an army of vampires. Crumbled feta cheese gives a nice flavor without upping the fat and calories much. Moroccan Chickpea and Sweet Potato Stew – Served as shown this stew is a complete meal. You’ve got protein and fiber from the chickpeas and sweet potatoes, plus they’ve paired it with quinoa so you’re getting a nutritional boost from that. A dollop of Greek yogurt adds extra flavor, a bit more protein, and is a healthier alternative than using sour cream. What you end up with is a dish that will not leave you feeling hungry shortly after eating. Easiest Ever Veggie Chili Meal – If you’re going to say something is easy, you’d better be able to back it up. Cait is up to the challenge on this one and she has you cutting plenty of corners, including getting the chili from a can. Pick out an organic chili and dress it up fancy like she does here and your taste buds won’t know you didn’t make it from scratch. Dill Pickle Lentil Soup – If you’re a fan of dill pickles and wondered if they could be the star of the show instead of just a side act, here’s a chance to find out. This recipe has you not only using dill pickles themselves, but the juice as well. There’s some anecdotal evidence that pickle juice may be good for you, but aside from that it just tastes good – if you’re a pickle fan, at least. You’re also getting lentils and other healthy herbs and spices, so it’s not just one flavor you’re experiencing. Negative Calorie Roasted Asparagus and Cauliflower Soup – The thought of a negative calorie meal is definitely inviting, since eating it would actually burn calories. Whether or not that’s the case here is moot because it tastes too good to care. The health benefits of asparagus and cauliflower are well-documented, and while the resulting color of the soup is not much to look at, you’ll likely return for the flavor it contains. See more healthy soup & chili recipes. Indian cuisine is known for being traditionally vegetarian, and they do amazing things with food without using any meat at all. The assortment of recipes here will allow you to experiment with Indian foods without using extra oils and fats. 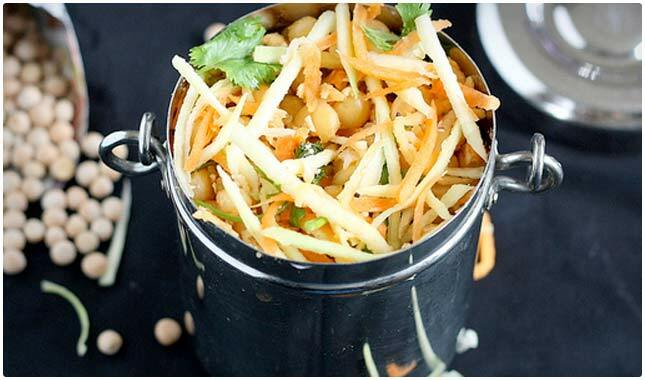 Beach Style Pattani Sundal – The presentation on these is really cute, and the ingredients list is a virtual showcase of foods that do the body good. You’ve got white peas, mango, carrots, and even some chopped coriander. Loads of flavor, all wrapped up in a cone shape, or served in a bowl or dish. There are plenty of pictures to guide you through the creation of this recipe to make sure you get it right. Potato And Eggplant Curry – Vegetables and curry go great together, the curry flavor seems to be well-absorbed by the vegetables, and even while you’re chewing them up there’s still plenty of taste to it. The combination of potatoes with vegetables insures that you’re going to get filled up by this recipe, and if you pair it with some other Indian dishes listed here you’re on your way to a nicely presented meal. Onion Bhajis – Here are nice little onion fritters that can be eaten separately but should really be added to a meal. Yes, they’re fried, but only lightly, and using sunflower oil. The ingredients they contain all have their own nutritious benefits. For example, the turmeric used as a spice has been shown to get your metabolism going. The garlic and onions have long been known for their cleansing properties. Two-Potato Vindaloo – The big chunks of potatoes gives it a nice presentation, but the flavor is what you’ll really notice. Vindaloo style dishes are popular in India as well as Indian restaurants, so it’s nice to bring much of the same flavor into your home. It contains metabolism-boosting spices like turmeric and paprika, plus cumin and coriander seeds for plenty of taste sensation. Lighter Chickpea & Spinach Curry – Here’s a curry that’s made a bit lighter so you don’t have to feel guilty about it. Using chickpeas is a great idea, they go nicely with the curry sauce. Spinach adds plenty of nutrients to any dish it goes into, including iron. This is a curry that will satisfy, and one that uses ginger and jalapenos to give it a bit of a kick. Red Curry Lentils – The color that this takes when it finishes is a nice sultry red that is due to the use of red curry paste. The lentils make it so that you’re getting a good deal of fiber, but also act as a “slow carb” keeping you satiated long after you’re finished, but without that stuffed feeling. There is also turmeric to rev up your metabolism, and if you serve over rice as shown you’re getting a great meal. Mexican foods are easy to make healthy, and easy to make without using meat. These recipes pack all of the flavor that you’re expecting from a traditional Mexican meal, but without the chicken, pork, or beef you typically find. 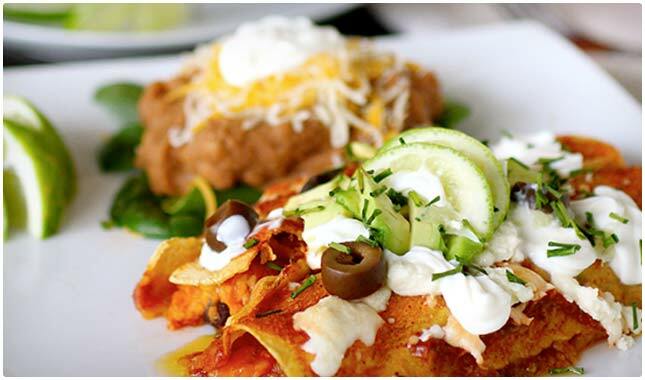 Sweet Potato and Black Bean Enchiladas – Enchiladas are most definitely a crowd pleaser, and are usually made with chicken or beef. If you’re going veggie style on them you have to bring something to replace those ingredients. In this instance they’re using sweet potatoes, which bake up really nice, as well as black beans to give it a thick texture that’s pleasing to the tooth. Mexican Baked Spaghetti Squash – Here’s a nice casserole-style dish that will feed the whole family, while keeping things healthy and tasty. The use of spaghetti squash as the central theme means you’re leaving out beef or pork that would greatly add to the fat content. They have reduced-fat cheese, and the whole dish is baked, which is one of the healthier ways to cook. Mexican Twice Baked Potatoes – Using the potatoes as the serving vessel makes for a great presentation, and baking them twice means you’ve baked them right. They use non-dairy milk to make the cheese sauce, and they’re using coconut bacon instead of actual bacon. This is a dish that you might want to serve your meat-eating friends and see if they can tell it doesn’t have meat. Savory BBQ Tacos with Avocado – It’s not often that you find the words savory and BBQ in a vegetarian dish, but they’ve got both of them here, plus it’s in taco form! Pinto beans are responsible for the filling, and it’s placed on a bed of spinach, so you’re getting a nutritious meal that’s a far cry from your local fast food taco chain. The barbecue sauce is made from scratch, so you get total quality control on the ingredients. HG’s Amazing ATE-Layer Dip – Hungry Girl cracked the code on the 7 layer dip and took it to a whole other level. It’s only a matter of time before someone comes along with a nine-layer dip, but we have to say this dip does look amazing, and keeps it vegetarian and healthy with a layer of black beans, as well as red peppers, veggie shreds, and a meat substitute. Perfect for game time or anytime you feel like it. Lentil Taco Pie – The lentils are going to give you a good amount of flavor for this pie shaped taco. They get style points for the presentation here, and you can feel secure making this for dinner guests, as it puts an eclectic spin on an old favorite. The avocado gives healthy fat, and makes it seem like tacos deluxe. Vegetarian pasta dishes are easy enough to make, and they generally provide a carbohydrate that balances nicely with vegetables, especially if some of them are a source of plant protein. Here are a trio of recipes that do a nice job of combining noodles and oodles of vegetables. 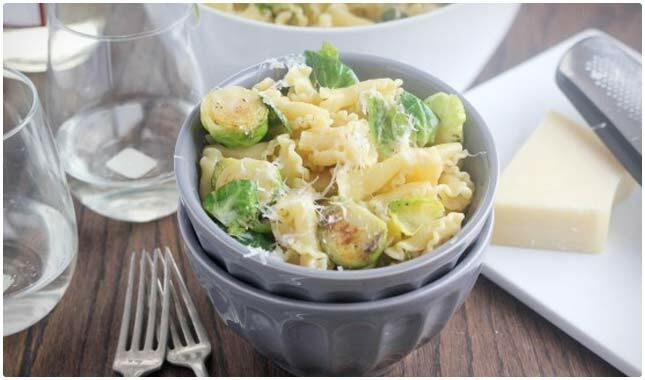 Campanelle with Garlic Brussels Sprouts – The campanelle pasta is one style that you might not have used before, but it has nice frills on the end that catch the eye, as well as the yummy sauce that comes with this dish. The Brussels sprouts need no introduction, it turns out your mom was right and these are super good for you. Roasting them gives them a flavor that might be new for most and really gets them to pop. Roasted Red Pepper Pesto Linguine – The red peppers here are what gives it its unique flavor, and what turns typically green pesto red. You’re also including kale, which has so many benefits its even thought of as being better for you than spinach. With garnishes of feta cheese and walnuts your taste buds will thank you, and so will your waistline. They’re using whole wheat linguine, which is a plus. Vegan Fettuccine Alfredo – If you’ve gone vegetarian but have had trouble moving to veganism, this recipe might help you along the way. It serves up the classic fettuccine alfredo that is on most every menu in Italian restaurants, and does it without using any animal byproducts. That means even though it’s creamy there won’t be any cream or butter so you don’t have to feel guilty. You can use Earth Balance to replace the margarine and keep it strictly vegan. See more healthy pasta recipes. Pizza is a sure winner with kids and adults alike, and these healthy vegetarian pizza recipes will make you forget about things like pepperoni, sausage, and ham. With so much going on there really isn’t any room for meat anyway. 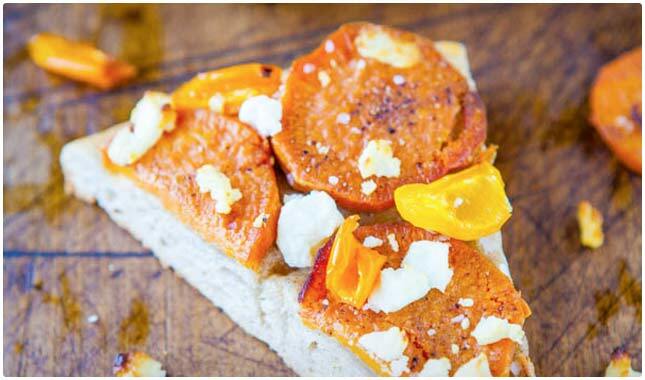 Roasted Sweet Potato and Goat Cheese Pizza – The sweet potatoes might look like pepperoni, but they won’t taste like it. They bring their own flavor, a sweet and savoriness due to the roasting process. The goat cheese replaces regular cheese, and you’re left with a pizza that you make from scratch including a whole wheat dough that only takes an hour to rise and bake. A fun project to do with the kids, or just for yourself. Three Cheese Veggie Pizza – Think you can’t have cheese and be fit at the same time? This author says otherwise, and she’s here to bring you the flavor you’ve been missing, without the regret that you don’t miss. Fontina, Parmesan, and mozzarella are the three cheese amigos she’s summoned for this very posh-looking pizza. The use of Italian cheese flavored crust means you’ll get a classic Italian taste to this and satisfy those pizza cravings once and for all. Pink Potato Pizza – Don’t adjust your computer screen, there is nothing wrong with your contrast. That really is a pink-shaded pizza. They’re using waxy potatoes, but they say that you can use any potato as long as you’re cutting it thin enough. They use a good amount of greens on this pizza as well, so you’re getting a blast of nutrients everywhere you turn. Green Goddess Pizza – Who ordered the green pizza? This is a monochrome pizza that brings plenty of different textures, and a host of superfoods to the table. The dough is made fresh, and there’s pesto here, plus an assortment of green foods that are going to lend their phytonutrients and flavor to make this a pizza you won’t soon forget. Asparagus and kale. ‘Nuff said. Check out more pizza recipes here. Quinoa has been getting a lot of attention lately, and showing up on more menus, not just a vegetarian restaurants. The health benefits make it a superfood, and its versatility means that it plays nicely in a wide range of recipes. 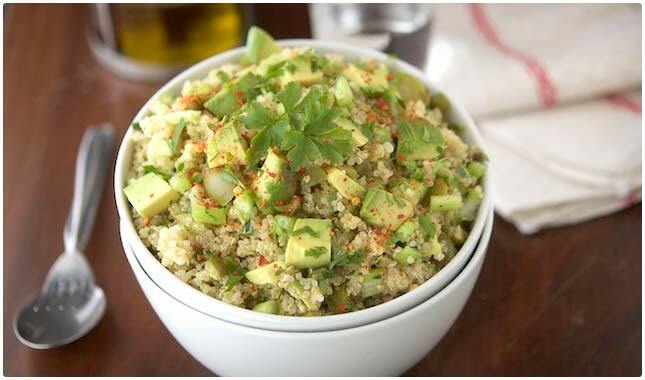 Green Quinoa Salad – A few green hued vegetables and avocado is all that’s needed to turn this quinoa a different shade. This salad is colorful and also really good for you with the use of celery, a superfood and something you should really be eating more of, especially the fellas out there. The avocado supplies healthy monounsaturated fats, and also a nice texture to complement the quinoa. Quinoa Baked Zucchini Chips with Sriracha Dipping Sauce – While not a meal in themselves, these make a great side to most any dish, or even as a potato chip substitute with a sandwich. The sriracha sauce gives it a nice spicy taste, and the baking instead of frying keeps these healthy. You’ll wonder how they could taste so good without being fried. That’s part of the charm of quinoa. Quinoa Patties – Not only will you know how to work with quinoa by the time you finish this recipe, you’ll end up with a nice bunch of patties that you can use as the base for a meal. This is a great entry-level recipe if you’re not familiar with how to cook quinoa. Luckily there’s not a very big learning curve, and a few attempts will have you cooking it like a pro. Bonus: you get to eat the results of the lesson. Quinoa with Acorn Squash, Apple, and Red Bell Pepper – With so many different colors and textures it’s amazing how much flavor can be in one dish. The squash and red peppers go nicely together, and the quinoa isn’t just along for the ride, it adds it’s own unique flavor while also soaking up the tastes of the other ingredients. The addition of fresh sage and thyme really puts the button on this recipe. Going vegetarian doesn’t have to mean giving up good-tasting foods. 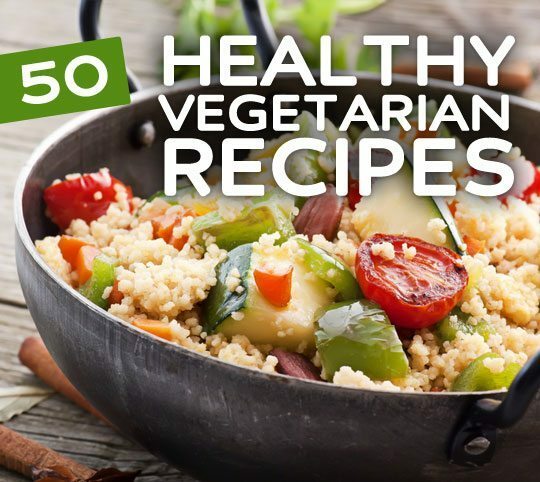 With easy access to so many healthy vegetarian recipes you don’t have to feel like there’s nothing to eat. With so many proven health benefits when comparing meat-eaters to vegetarians it makes it worth your while to at least start having a few more vegetarian meals than you currently do. You don’t have to join PETA or get new friends in order to get the benefits of eating less meat. What a scam there are NO recipes. Where can you find the recipe that you want? Are… Are you joking? You click on the link. However, the lentil sloppy Joe in the burger section links to a recipe that while predominantly made from lentils, still includes ground beef on the ingredients list – it’s just mixed in with the lentils and therefore that recipe is definitely NOT vegetarian! All of these sounds amazing. No I have some future quick lunch ideas.